P51 Mustangs of 336th Fighter Squadron, 4th Fighter Group range deep into the Reich in a search for targets of opportunity. As the Second World War drew to a close, Allied bombers and fighters were able to fly relatively unchallenged over German territory. A lack of fuel, trained pilots and serviceable aircraft prevented the Luftwaffe from mounting any meaningful resistance. 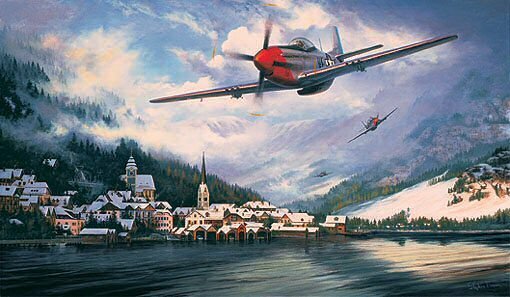 By VE-day the 4th Fighter Group had become the top scoring Fighter Group with over 1,000 victories against the Luftwaffe.